I hesitated to write this blog. Normally, when we have major elections I will reach out to my followers and encourage them to vote. The reason I was hesitant to stick with this tradition is that it is been an incredibly tumultuous election cycle. It is not my place to tell you which candidate to vote for and I certainly am not going to use my platform as a place for political discourse. There are many other avenues for that. I simply want to remind all my fellow Americans that tomorrow, November 8th, 2016 is an important day in our history and it is our privilege and right to vote. 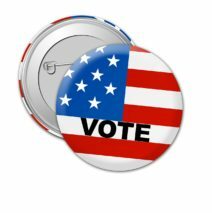 If you aren’t certain what you need to bring with you or where you are even going tomorrow please visit https://www.usa.gov/election-day. Tomorrow morning I will be heading to my polling location and if the primaries were any indication, I may be in line for quite some time. I will have my trusty cell phone at my side so as long as internet service holds out I’ll be checking in as needed. I’ll just end this with a simple plea: Go rock your vote.